The same story continues for the Bears but a different opponent. 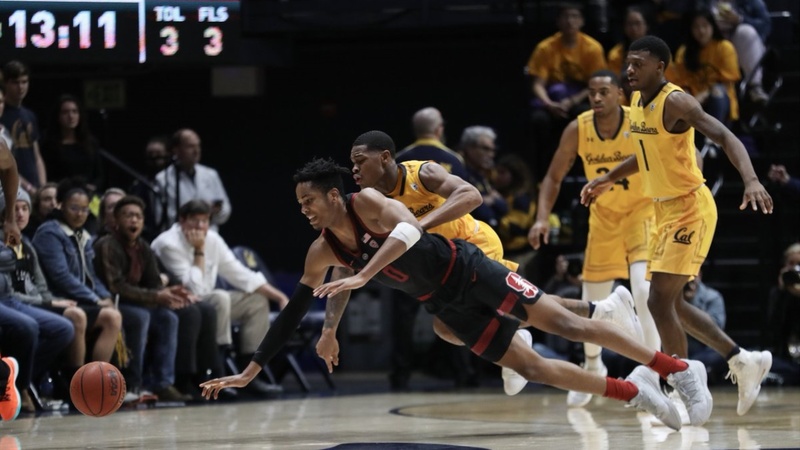 Cal stays close for a while, but eventually, Stanford pulls away with an 84-81 win and hands the Bears ten consecutive losses tie Cal's 1962 team for the longest in school history. Justice Sueing had 23 points, and seven rebounds to pace California (5-16, 0-9) and 7’3 center Connor Vanover chipped in a career-high 15 points. Sueing remains optimistic after and a 0-9 mark in the conference:"Once we get over that hump, we'll be able to turn the table and take that momentum and finish the right way." The game featured 12 ties and 11 lead changes, and neither team could pull away from the other trading off runs the whole game after a controversial play that saw Bradley drive baseline and scored for an apparent tying basket. Stanford's Josh Sharma was initially called for his fifth foul, but the play was reviewed by officials and overturned. After the play, Stanford’s Okapala made a game-clinching free throw with 13.3 seconds left and saw Paris Austin miss a game-tying three as time expired. Okpala scored a career-high 30 points and had eight rebounds to pace the Cardinals (11-10, 4-5) along with Bryce Wills who added 16 points and Daejon Davis who chipped in 14. The Cardinal have won three of four and play Oregon State on Thursday. Cal falls to 0-9 in conference play and 5-16 overall. Up next for Cal is a game on Wednesday against Oregon.